France: Will Paris have Europe’s closest derby? In the upcoming season Paris Saint-Germain will have a football rival just across the street. If they meet in the French Cup, away game will mean only 17 meters for both of them! One of Paris’s oldest football clubs, Red Star FC, will use Stade Jean Bouin for their home games during the 2016/17 season. The ground lies just 17 meters north of Parc des Princes, home to PSG and currently one of the Euro 2016 host grounds. 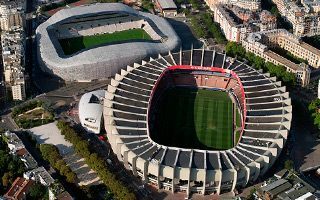 These two stadiums lying just beside one-another is a phenomenon in and of itself, but there’s normally no connection between them, aside from both being covered in concrete. One is used for football, the other for rugby. Now that Red Star failed to secure license for their Stade Bauer in Saint-Ouen district, this will change. Last season Red Star also had to play away from their spiritual home, but they faced a 70km drive north to Beauvais. Now that their home games will be within a few subway stations from home, many supporters expressed enthusiasm. They’d prefer Stade Bauer, surely, but it seems to be a safe compromise. Red Star will pay €500,000 for the season at Jean Bouin, somewhat less than regular tenants, the rugby side Stade Francais. Red Star are a Ligue 2 team, which means there’s no direct contact between them and champions Paris Saint-Germain. Still, the two may meet in the French Cup or the League Cup. Should that happen, Paris would host Europe’s closest derby with both teams just 17 meters apart. Across the continent there is only one case, where rivals are situated closer to one-another. It’s Budapest, where MTK and BKV Előre have their stadium just 13 meters away from one-another. But they’re two leagues apart and MTK’s stadium is under complete reconstruction, so for the time being Budapest is no competition. The most famous case, largely due to both teams frequently facing each other, is of course the Scottish city of Dundee. Here Dundee FC and Dundee United are under 100 meters apart. Of course we're not including clubs sharing one ground in our distance calculation, because it's a different story.